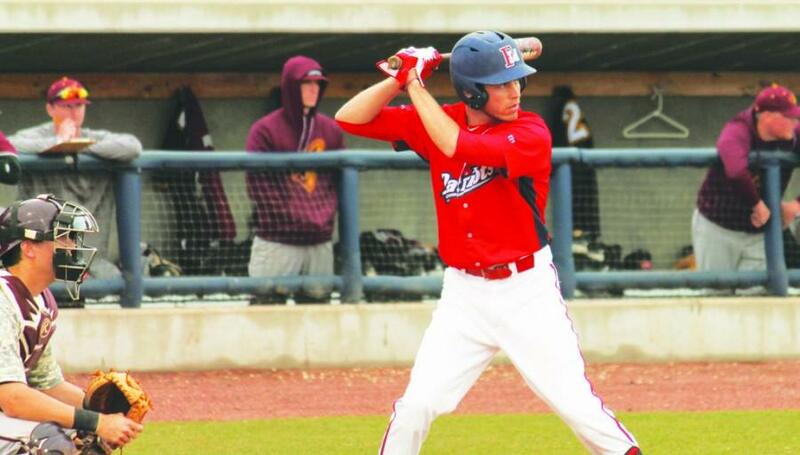 Shortstop Zach Callahan went 2-for-4 against Armstrong on Sunday. He averages .424 at the plate so far this season. 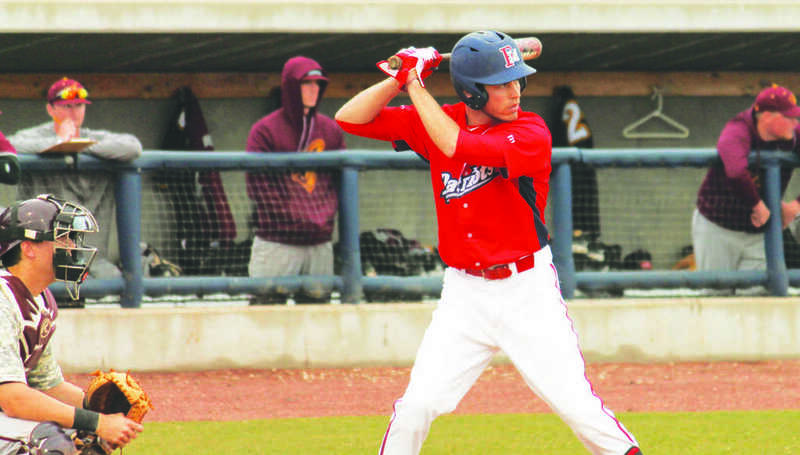 After a come-from-behind 5-4 win on Saturday, Feb. 21, the FMU Patriot baseball team kept rolling and defeated the No. 14 ranked Armstrong State Pirates with a 5-3 victory on Sunday, Feb. 22. The second game of Sunday’s doubleheader was cancelled after two innings due to inclement weather. FMU remains undefeated in the Peach Belt Conference (PBC) at 2-0 with an 8-3 season record overall, while Armstrong dropped to 3-2 in the PBC with a 9-3 season record overall. During the 1 p.m. match on Sunday, both teams remained scoreless through the first four frames. The Pirates scored first as designated hitter JT Phillips hit a single to third base and advanced to second after FMU junior third baseman Randy Loew’s throw to first was too high. Patriot senior starting pitcher Jordy Santak walked the next batter. Phillips and one other player came home after a single to center field. FMU batters responded in the bottom of the fifth after designated hitter Ryan Miller led off the inning with a single. The next batter, sophomore shortstop Zach Callahan also got on base. With two on base, a sacrifice bunt by junior centerfielder Casey Clauss turned into a run for FMU due to a Pirate throwing error. A walk from Armstrong pitcher Pete Nagel loaded the bases for FMU with no outs, but the Patriots did not score again that inning. A catch by the Pirate first baseman got Callahan out at home, and the next batter grounded into a double play, ending the inning with three men left on base. With the score 3-1 after six innings in favor of the Pirates, the Patriots rallied for four runs in the bottom of the seventh to gain the lead, and eventually the win. Loew doubled in one run, extending his hitting streak to 11 games, while junior left fielder JD Crowe plated one run with ground out. Senior first baseman Connor Wessel picked up the game-winning runner batted in, and an insurance run scored on a two-out throwing error. Wessel had a 10-game streak alive as he went 2-for-5, while Callahan was 2-for-4. Defensively, junior pitcher Ryan Manore earned the victory, going hitless for over a full inning. Junior closer Jeremiah Freeman allowed no runs in the last 1.2 innings and recorded his first save of the season. Santak allowed two runs on three hits with three strikeouts in six frames of work. FMU will take to Cormell Field again for a three game stand starting at 1 p.m. on Saturday, March 7. The doubleheader is set to start and the third game will start at 1 p.m on Sunday, March 8.